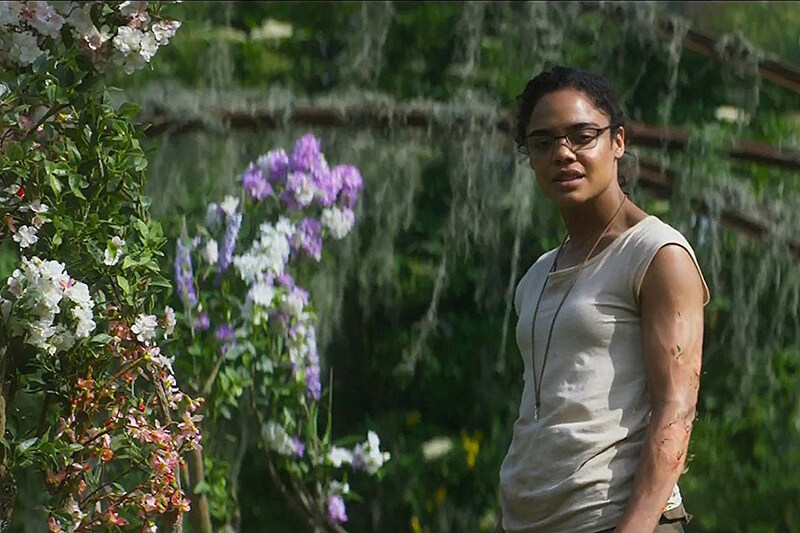 Alex Garland’s Annihilation may share a title with the first book in Jeff VanderMeer’s Southern Reach trilogy, but the film is very different from the 2014 sci-fi novel. The movie doesn’t just take some liberties with VanderMeer’s material; Garland’s film, about five women who travel into a mysterious region called “The Shimmer,” mainly uses the novel’s ideas as a jumping-off point. From there, Garland explores his own themes, wildly diverging from the book to chart a journey of mind-warping, bone-chilling extremes. But that doesn’t mean the book doesn’t provide further insight into Garland’s cinematic puzzle. The Ex Machina filmmaker has described his latest as less of an adaptation and more of a dream interpretation of VanderMeer’s book, which makes a lot of sense considering how much the novel leaves up to the imagination – after reading it, I even had some of the freakiest dreams in recent memory. 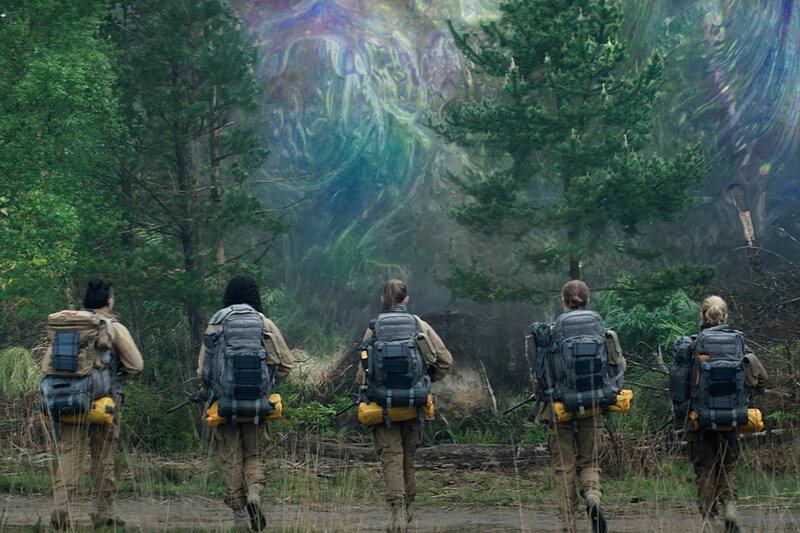 It’s also worth noting that VanderMeer came up with the idea for the book after having a fever dream post-dental surgery, and that Andrei Tarkovsky’s very dream-like 1979 film Stalker, also about a trek to an inscrutable area within nature, was Garland’s only film reference when making Annihilation. Now that you’ve seen the film, you’re probably still scooping up pieces of your melted brain off the floor. It’s a mesmerizing, terrifying, inventive film, one that is going to leave audiences bewildered for years (you can read our spoiler-free review here). But can VanderMeer’s first book can offer us further clues to piece together Garland’s wild cerebral maze? Yes and no. I’ve broken down the biggest similarities and differences between the two, and which elements of the novel can help interpret the movie. I strongly recommend you go pick up the book if you haven’t; it’s a succinct and thrilling 208 pages, but if you truly cannot wait, here’s your spoilery guide. You’ve been warned of massive film and book SPOILERS. While VanderMeer’s book follows four unnamed women, referred to only by their professions – the Biologist, the Psychiatrist, the Surveyor, and the Anthropologist – Garland gives each of his characters names and adds a fifth to the mix (though technically there was a fifth in the book, the Linguist, whom we never meet). 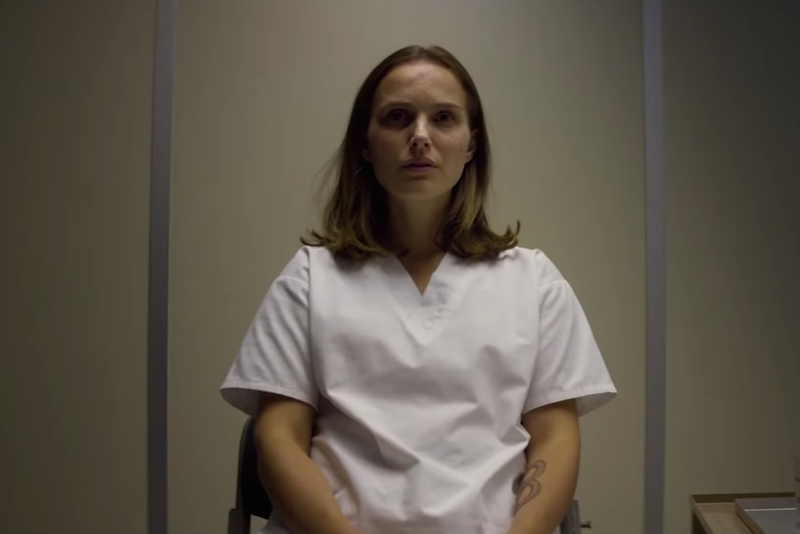 Natalie Portman is Lena, a former soldier and current Johns Hopkins professor who studies the life cycle of cells, though in the book she had no military background. Oscar Isaac plays her soldier husband Kane, who’s just returned from a mysterious mission that’s left him with multiple organ failures (in the book he dies of cancer). 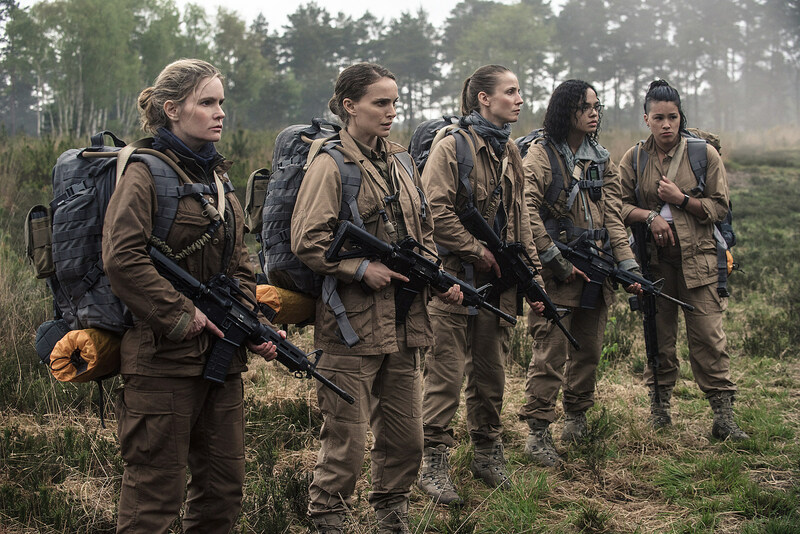 Gina Rodriguez is Anya, a brash paramedic; Tessa Thompson is Josie, a reticent physicist; Tuva Novotny is Cass, an anthropologist in mourning; and Jennifer Jason Leigh is Dr. Ventress, a psychologist who works for a top-secret organization and leads the team of women on their expedition. In the book, there’s a stiff air of hostility and mistrust between the four women. Each one is continually suspicious of the others’ motives, with little interest in getting to know one another. This only adds to the tense and sinister atmosphere of the novel, with each character committed to their own survival. But in the film, Garland gives his characters a warm sense of camaraderie with more compassion for one another, and notes of humor among their daily interactions. He also gives each woman a relatable motive for undertaking the dangerous excursion – one is a recovering addict, another prone to self-harm, another grieving a dead daughter – which ultimately plays into the film’s theme of self-destruction. Speaking of the differences between the characters, as you’ve surely heard by now, Garland’s film has been criticized for whitewashing the two lead characters. While the Biologist and Psychologist’s ethnicities aren’t addressed in VanderMeer’s first book, later in the Southern Reach trilogy he describes the former as having Asian heritage, and the latter as half-white and half-Native American. Garland said he wrote his script solely based on the first novel, while Portman and Leigh both said they weren’t aware of their characters’ ethnicities prior to the recent controversy. Technically, “The Shimmer” — the enigmatic phenomena of the film that encompasses a portion of the Florida coastline within a permeable, oil-and-water-like border — is a name invented by Garland. In the book, that zone with an ever-expanding border is referred to as Area X. (The film uses that name once — in a title card.) While it’s highly secretive in the movie, in the book it’s known to the public as a mysterious region that fuels conspiracy theories. VanderMeer offers a little more background on it than Leigh’s Dr. Ventress does. According to the first book, Area X was originally a wildlife refuge inhabited by fisherfolk near a military base, but after an “ill-fated Event that locked it behind borders 30 years ago,” it became the source of many “inexplicable occurrences,” and its previous residents suddenly disappeared. There is one explanation for what caused this event, but it remains suspicious: “The government’s version of events emphasized a localized environmental catastrophe stemming from experimental military research.” The film offers a visualization of the Event in its opening scene: A meteor crashes into a lighthouse. In the movie, Lena’s trip into the Shimmer is told via interrogation scenes after the fact. Benedict Wong’s Lomax, presumably a higher-up at Souther Reach, questions her about how she came to be the only survivor of the expedition. (It’s also worth noting some of these scenes were added during reshoots.) Because of this, we know Portman’s character returned from the Shimmer (sort of ... more on that below). The book is also told through the narration of the Biologist, specifically via a diary recounting her experiences inside Area X. This is important because it forms how we, the reader, experience Area X – essentially through her internal thoughts and feelings. The region isn’t described through typical visual descriptions, but through the emotions the Biologist feels when reacting to her surroundings. Part of the brilliance of VanderMeer’s book is how he sculpts such immense unease and terror through a character’s internalized thoughts. But Garland beautifully renders that psychic anxiety in both the visual and sonic atmosphere of his film. Despite their many differences, both the movie and the book depict an unravelling of the psyche. The more time the Biologist spends inside Area X, the more she questions her reality as her body begins to transform into an indescribable phosphorescent essence. In the film, the women begin to panic over the oddities and horrors they encounter inside. Dr. Ventress describes the effects of the Shimmer like “the onset of dementia,” as if she’s slowly disintegrating. 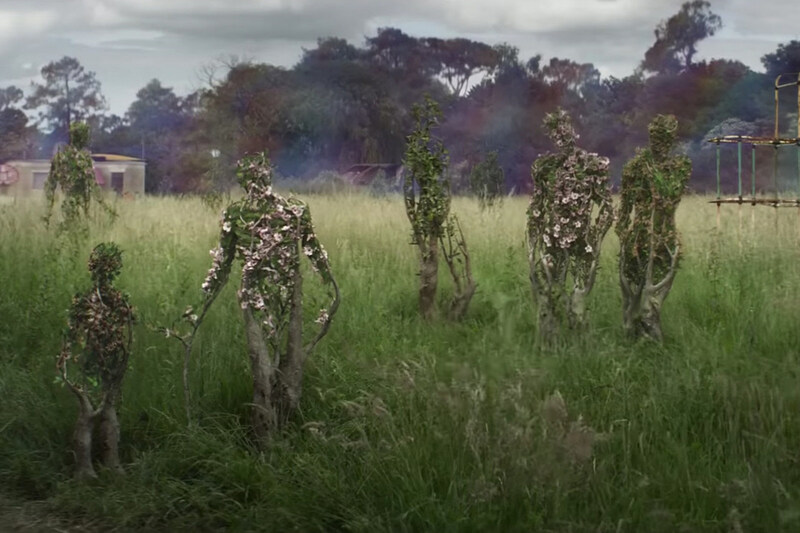 But what makes Annihilation such an unsettling and mesmerizing cinematic treat is how Garland translates that concept through surreal visuals and sound design. We see the women’s descent into madness via Anya’s increasing fear and paranoia, and the way her fingerprints move across her hands; with Dr. Ventress’ warped face in the shadows of the cave and the hypnotic acid-trip visuals; and the paralyzing, dance-like sequence with Lena and her alien (/whatever the hell it is) copy near the end. The visual world of the Shimmer is very much Garland’s own – the rainbow-hued, oily border, which is also strewn across the various bodies of water in the movie, isn’t depicted as such in the book. Area X is described by the biologist as an extreme transitional environment that’s home to a complexity of ecosystems, with marshland, marine habitats, forest life and swampland all impossibly coexisting. We do see bits of this echoed in the film as the women travel from a rainforest to a beach, but Garland depicts his world with a sense of magnificent beauty and lushness that slowly turns frightening and ominous. The human-like plants the women discover in a field are taken from the book. In it, the Biologist finds an abandoned village with “peculiar eruptions of moss or lichen” that form “limbs and heads and torsos.” But the explanation behind these in the movie is all Garland’s. Thompson’s Josie describes the phenomena of the Shimmer as a prism that refracts all DNA, thus creating a sort of ecological copy of human DNA structures to form plants that mimic human bodies. This may also explain the animal mutations. In the film, Novotny’s Cass is killed by a bear-like beast; later a similar creature screams in her voice. Did she become a second bear creature? Did the one who killed her absorb some of her essence or DNA? Considering Josie’s hypothesis, it seems like the latter. But if we look to the book for more clues, it could be a combination of the two. In the book, the Biologist describes Area X and everything within it as having a watchful presence, noting that the living creatures and the life-like plants have oddly human qualities. She describes a dolphin looking at her with a human eye, a beast that sheds the face of a man she’s seen before, and eventually the Psychologist’s body appears to decompose into the landscape as she dies — not unlike Josie’s vine-infested body in the film. The book never gives us answers, but seems to suggest that the expedition members who entered Area X molted into its natural environment and turned into various lifeforms. I have a hunch that the film is similar, but takes a more scientific approach. Cass’s DNA wasn’t just refracted into the beast, but her consciousness, along with her voice, transferred into it. Consider the fact that when we hear the beast scream, it’s Cass saying, “Help me.” Why would the creature shriek such a message, especially when it didn’t appear to speak before? There’s clearly confusion and terror in her voice, and almost a resistance to the creature’s motive to kill. Think about it in terms of Black Mirror‘s “Black Museum” episode, with multiple consciousnesses living inside one organism. In the Shimmer, it’s as if people, either voluntarily like Josie or unwillingly like Cass, fuse into the natural world around them. Lena’s snake/infinity tattoo is an invention all Garland’s own, but it further explains the above theory about the natural transference happening within the Shimmer. We first see the ouroboros ink on Lena’s left forearm in the beginning of the film during the interrogation scene, but you’ll notice the tattoo doesn’t appear in the flashbacks to her life with Kane or to her time in Area X before she enters the Shimmer. ScreenCrush’s Britt Hayes noticed that the first time it appears, chronologically, is on Anya’s arm when she first meets Lena at Area X. So we know the tattoo itself isn’t a result of The Shimmer. We then see it on the disembodied arm of the corpse inside the empty pool, at one point, a bruise appears on Lena’s left arm where the tattoo will later be. Once Lena reaches the lighthouse, the tattoo is in full view on her arm. Like Cass’ voice inside the bear, and like the human qualities of the animals and plants in the book, the tattoo seems to be duplicated on other bodies within the Shimmer who absorb some of Anya’s essence. And the tattoo design is far from random: an infinity ouroboros is a pretty straightforward symbol of the cyclicality of nature, the death of one thing bringing life to another. That’s exactly what the Shimmer is doing, “stuck in a continuous mutation,” as Lena says when she inspects the multi-species plants. Another main theme in Garland’s film is the subject of self-destruction. “Almost all of us self-destruct,” Dr. Ventress says to Lena. “Isn’t self-destruction coded into us, in every cell?” She draws a sharp line between suicide and self-destruction; at least with the former we make a decision, whereas the latter sneaks up on us in unsuspecting ways. And then there are the literal self-destructions, as when Lena obliterates herself, or perhaps her alien-like double, with a flash grenade near the end of the film – another thing to note is that she self-destructs in such a beautiful way, in a ball of glowing white light, as opposed to the harsh violence of a typical lethal grenade. I’m still mulling over what all of it means, and how the Shimmer conjures various reactions within each of the women. Perhaps these women have been self-destructing all along back in the real world, quietly suffering from their own traumas; it’s only when they reach the Shimmer that they’re faced with the realities of that pain, given an opportunity to control it and a chance at catharsis. I’m struggling to justify both Anya and Cass’ upsetting fates within the Shimmer, but Josie, Dr. Ventress, and Lena are the most transformed. Josie makes a peaceful decision, yielding to the Shimmer’s effects by merging with it. In a sense, that’s one form of self-destruction — leaving behind her former pained self, someone who cut herself to feel alive; now she’s literally transmuting into a living plant. Dr. Ventress, who has cancer, also yields in a way. She utters “annihilation” repeatedly before spewing rays of white light and turning into a massive psychedelic wormhole thingamajig. There’s a few connections to the book here. 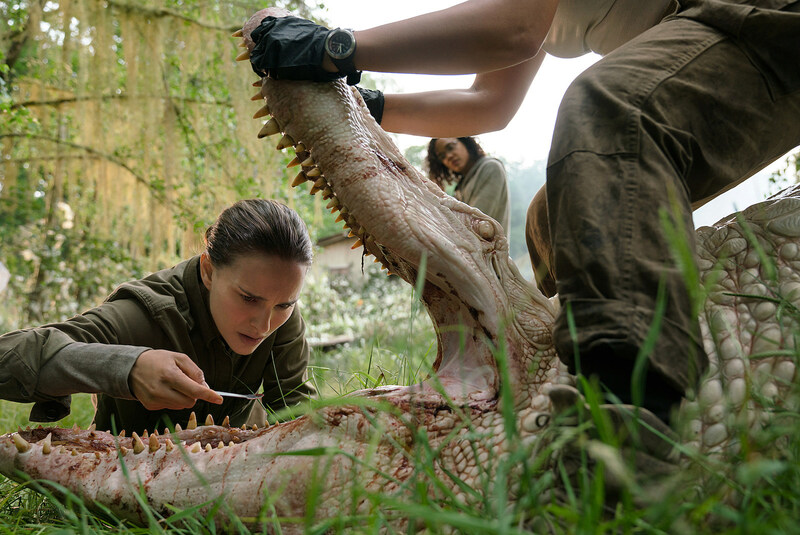 One, the term “annihilation” is revealed to be a hypnotic suggestion that the Psychologist uses to help induce immediate suicide – and it fails to work on the hypnosis-immune Biologist. In that sense, in the book, suicide isn’t a choice, but something forced against one’s will. In the film, Garland gives his characters the power to choose how they self-destruct; it’s almost like a gift the Shimmer gives to the women that the outside world has taken from them. The buzzing sound again intensified until it was so jagged and hissing that I felt as if blood might trickle from my ears. I did not feel as if I were a person but simply a receiving station for a series of overwhelming transmissions. I could feel the brightness spewing from my mouth in a half-invisible spray, meeting the resistance of the mask, and I tore it off with a gasp. Give back to that which gave to you, came the thought, not knowing what I might be feeding, or what it meant for the collection of cells and thoughts that comprised me. After escaping its presence, she encounters the Crawler once more, describing it as “the most beautiful, the most terrible thing I might ever experience.” She writes of a “terrible invasiveness” and pain where her skull is being “crushed to dust and reassembled, mote by mote.” VanderMeer’s scene is different from the movie’s, but you can definitely see the seeds that spurred Garland’s imagination for the lighthouse and cave sequence. So, what the hell is that shimmery Lena No. 2? Where did it come from? Is Lena really Lena at the end, and is Kane really Kane? Honestly, I don’t know and I don’t think anyone will ever know. But I have some ideas. First, there is mention of doppelgangers in the books. The Biologist finds a journal that belonged to her husband (whose narrative is similar to Kane’s), in which he recounts seeing his own doppelganger walking out of the tower: “I walked stiffly. I had such a blank look on my face. It was so clearly not me ... and yet it was me.” He imagines that he’s dead and looking at his own ghost, and we get no further explanation beyond that. The film takes an entirely different route with those body doubles, suggesting a possible extraterrestrial entity. When Wong’s interrogator asks Lena if it was alien at the end, she slightly nods “yes,” but I believe it’s much more complicated than an aliens-invaded-Earth, Body Snatchers–type deal. Garland’s film is all about the duplication and multiplying of cells; as Lena says, “corruptions of form, echoes, mutations.” Like the deer Lena spot in the forest and the pairs of eel-like fish in the swamp, she comes face-to-face with her own doppelganger. She’s trapped in a trance-like ballet, a continuous cycle of mutation where her every movement is mirrored beside her. You could read it as Lena being confronted by a manifestation of her own anxieties and fears, or maybe she’s wrestling with past, present, and future versions of herself, or of all selves – the combined pain and baggage of Dr. Ventress, Josie, Anya, Cass, Kane, and every expedition member, reflected back at her. I think it all ties back to the idea of self-destruction; to obliterate one thing out of existence, and make room for something new to grow. That new thing isn’t an exact copy, but perhaps an evolved copy. Lena kills one form of life, and one form of herself, and leaves as another, transformed. The Lena we see at the end with the golden glimmer in her eyes isn’t the professor we met at the beginning, nor is she an extraterrestrial clone; she’s some sort of hybrid of herself and all the experiences the Shimmer imbued within her. At least, that’s my takeaway after one viewing. We may not know the why or the how, but I don’t think answers to those questions necessarily matter. And that’s where Garland’s film and VanderMeer’s novel share the biggest overlap: Both are distinctly visceral experiences beyond words and explanation. They defy reason, asking you to submit. My advice? Just let the Shimmer wash over you.